Welcome to Ray Fransen's Drum Center, the oldest and largest store in Louisiana dedicated exclusively to drums and drumming. The store came into existence 30 years ago as an extension of Ray's dedication to performing and teaching. These goals, along with the propagation of drumming as an art and a hobby, have continued to be the chief motivating forces behind the store's success. Our emphasis is that in drumming, as in most things in life, everything interlocks. Our concentration on teaching has produced some of the most highly considered performers to come out of the city of New Orleans as well as a direct involvement in many of the area school programs. In this direction we have presented more clinics and seminars on drumming than any other organization in the area. In doing these presentations we have not only showcased internationally famous performers/clinicians, but also our sterling local talent. Professionals, semi-pros, and amateurs can all feel confident that their needs will be met in terms of both equipment and information. We know that the proper selection of equipment is very personal and fundamental in achieving the correct level of self-expression on the instrument. 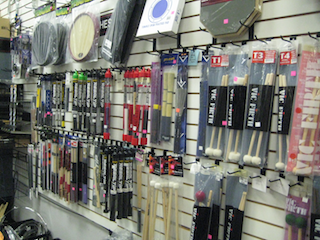 We're willing to work with any player to find out who they are and how our store can help them further their drumming pursuits whether it be in the area of drums and drum equipment, education, repair, or plain old info. We'd be glad to make you part of our family.